This lovely turtle would add interest to any under the sea display. You can have the model on it's own or with more of the models in the same series. This turtle model is fun and comical and fits well into any scene featuring our funny animal series. 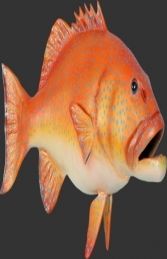 Why not make this fully 3d fibre glass part of your under water display.